This is a young project and we are still learning about ways that we can open up the creative process to include more people. Do we throw open the doors and just invite everybody to participate, or do we use a more measured approach? 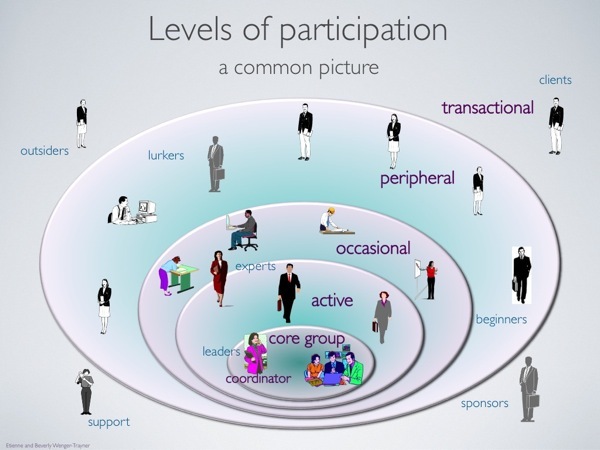 Based on our extensive community experience, a particular concern is how we support varying levels of participation. One approach under open collaboration to build a community of practice. There are many existing, already well-established platforms, e.g., Wikipedia and Facebook, which already invite all to create accounts and contribute. In these cases, it is the end-users who create the majority of the content. We are considering use of the Intentional Community Wiki (IC Wiki) as a repository for public information. One concern using this platform is its use of the Attribution Share Alike creative commons license. This requires any derivative work, which draws content from the wiki, to adopt the same license. Cohouseholds are more environmentally sustainable – sharing reduces our carbon footprint. Cohouseholders are good neighbors - as they strengthen a neighborhood's sense of community. Like home shares, Cohouseholds are created using processes that help increase the household's success. While you can easily create a shared household - just rent out rooms in your apartment or house - it takes more intention to create a cohousehold. Cohouseholds can better meet the economic and social needs of their residents, while reducing their environmental impact. It is our vision that many cohouseholds will operate indefinitely – the residents may change, but the household persists.